Corn on the cob is plentiful in the summer months. It seems to be everywhere! From roadside vendors, farmer’s markets and the produce section at the grocery store, corn on the cob is, to me, a summer staple. We normally boil it and serve it whatever meat we are grilling that day. I love adding a pat of butter on my hot corn on the cob and seasoning it with salt and pepper. So good! This summer, I’m making it my mission to try some new corn on the cob recipes. I need to step outside of my comfort zone and see if I can find other recipes that can rival this old favourite. We are having corn on the cob tonight with dinner so I might just have to try one of these recipe out! I usually just have it with butter. Never thought of doing other things. I’m loving some of these ideas! I’ll have to try the Parmesan Garlic Grilled Corn….sounds so tasty! Thank you for including my Chili Lime Corn on the Cob! Can’t wait to try out some of these other recipes. They look delicious!! I never thought of roasting my corn on the cob in the oven. I’ll have to try it! The Parmesan Chipotle sounds great. The Bacon Wrapped Corn on the Cob sounds delicious! Wow! I never new there were so many ways to serve corn. I am super boring and definitely going to try something different the next time I make corn. 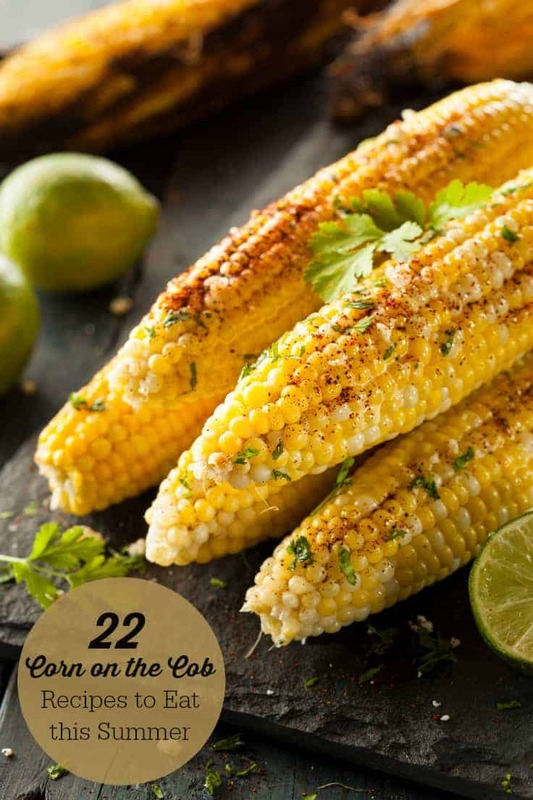 I would like to try the Grilled Corn with Spicy Cilantro Lime Butter! That sounds so good. The Batter Fried Corn on the Cob could be a lot of trouble over here….. Thank you so much for all these great recipes! I love my corn, but I can’t eat it off the cob, which is fine because it still tastes good when I cut it off the cob, mmmm fresh corn!! Hi Stacie, thank you for featuring our recipe for corn on the cob roasted in the oven 🙂 See you on Fridgg! This gives you way more than just butter and salt on the corn on the cob, and I appreciate the variations. Keep up the great recipes. I’ve clicked on several. Any of them with butter would work for my husband. I admit I just had to click on A PIECE-A PIZZA CORN. I am sooooo ready for the corn on the cob to have this summer!! We love it. And I love having all the fresh veggies we plant in our garden….so good! These are some great recipes and so I am pinning to have and try for us when we have our BBQ’s. Thanks for sharing. Love corn on the cob. So fresh and delicious, no matter what you do with it. I will be trying some of these over the summer,thanks! The past month has been the perfect time to do some of these recipes and I love corn. There’s quite a few that I really want to try soon.